It's easy to repair a Therm-a-rest, Big Agnes, Nemo, REI or other style sleeping pad with Tenacious Tape Flex Patches, or the Seam Grip WP Repair Kit. Fix the leak and get a good night's rest on your next camping trip. 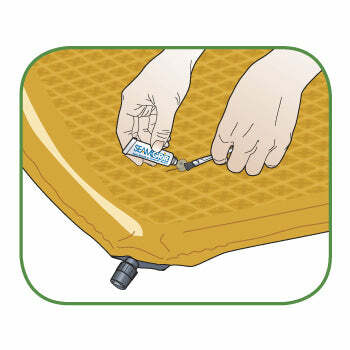 The first step in repairing your deflated sleeping pad is to find where the air is leaking. To find the hole, inflate the pad and listen for the leak. If you don't find it right away, you can either pour soapy water on the sleeping pad or submerge the pad in water. Watch for bubbles to indicate where the air is escaping. Once you've found the hole, mark it with a felt-tip marker. If it's a puncture hole, check the other side of the pad to see if the puncture went all the way through and out the other side. After you've marked the hole, you're ready to begin the repair. Clean and dry the area to be repaired. Isopropyl alcohol works well for cleaning the repair area. Apply Seam Grip WP adhesive to cover the hole and spread 1⁄4” (5 mm) beyond. Allow Seam Grip to dry level overnight. To use the repaired pad at once, center the Tenacious Tape Repair Patch and apply over uncured Seam Grip. 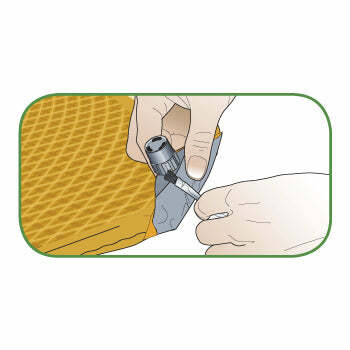 The patch must extend at least 1⁄2” (10mm) beyond the Seam Grip. Press the patch firmly onto the pad. Your sleeping pad is ready for use! Allow the patch to remain for 3 to 4 days, then remove. The Seam Grip will have permanently sealed the hole underneath. 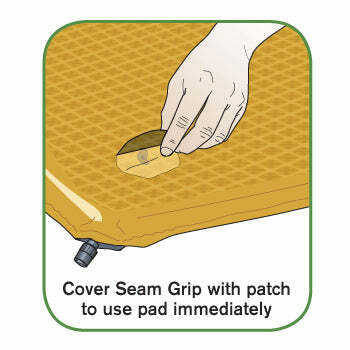 Seam Grip WP seals small holes and leaks in the sleeping pad nozzle area. Seal it and stand upright overnight.